When I went to Scrapfest a few weeks back, I said to myself (and to my husband) that I was not going to buy any paper. I have tons and some of it is from a paper shopping spree at Scrapfest a few years back. No, I was not going to buy any paper. I was going to use what I have at home. That was the rule! Well, you can imagine how long that lasted once I got to the show and was surrounded by paper and paper and paper (oh, my). 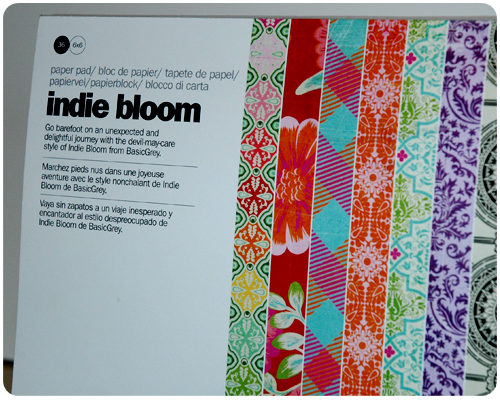 But to my credit, I showed unbelievable restraint and only bought this one lovely pad of patterned paper: 36-6x6 sheets of indie bloom by Basic Grey. It was in a clearance bin for only $3.00 (which was enough justification for me). 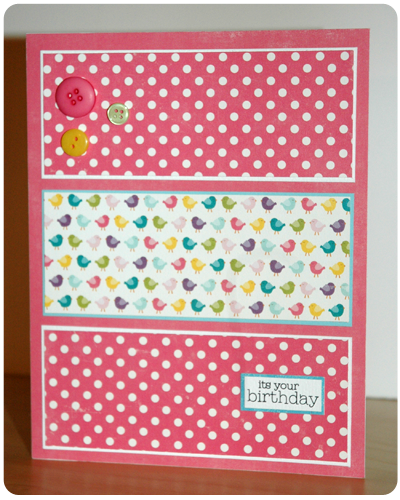 So, for the next few weeks I am going to be making as many cards as I can from this one $3.00 pad of patterned paper. All additional supplies needed - cardstock, embellishments, chipboard, buttons - must come from my stash. No additional purchases allowed. 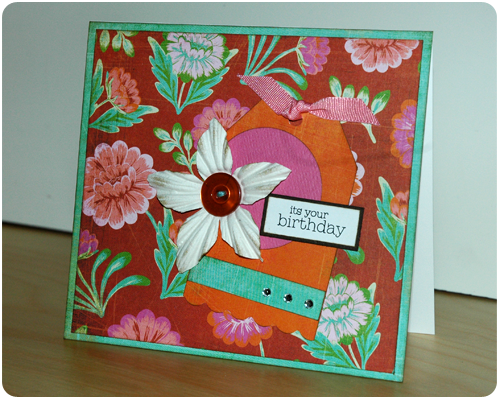 Cards can be any size - full size greeting cards, note cards, and maybe even tags so to stretch the supplies even further. Even if you don't have a full 6x6 pad of patterned paper, just grab one 12x12 piece of paper and see how many cards/tags you can make from it. I've always loved the idea of yarn wreaths as a way to add a seasonal and homemade touch to my home, and as a way to use up some of the yarn in my (enormous) stash. But I have never made one because those foam wreath forms are not cheap. 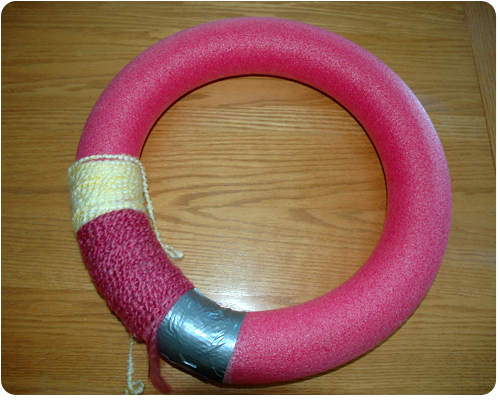 So when I read about someone who had used a pool noodle to make a wreath form....well, I thought it was a brilliant idea and ran to my shed to grab a noodle. I mean, making something using something that I already have...that is right up my alley. As my girls stood in the kitchen with me, questioning what I was doing with their pool noodle, I cut it to size and began 'duct taping' it together to form a circle, assuring them that I would replace it and that I was using this particular noodle to make something beautiful. I then grabbed some yarn from my stash - Lion Brand Homespun - and began wrapping my wreath. 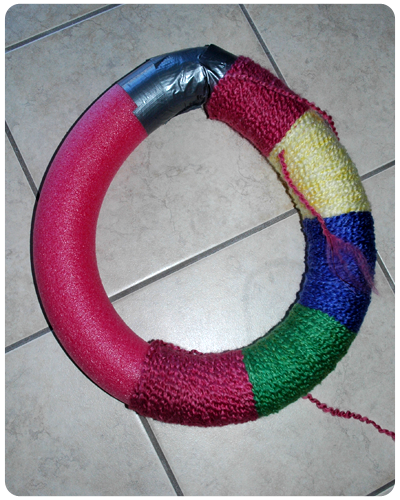 I got so far wrapping yarn around my wreath - and I loved how it looked - when I got sidetracked...and I did not get back to working on it until the next afternoon. Instead of a circle, it was getting a point on the one side as the ends of the noodle pulled apart. So I ripped the duct tape off, glued the ends of the noodle, and then duct taped them together again. That did not work - it still pulled apart. I then ripped everything apart, cut the noodle ends at 45 degree angles, glued them and duct taped them together using an insane amount of tape. Still no success. I had a pointy wreath and it looked ridiculous. I figured that while the noodle had been free, I could have bought a wreath form for the cost of all the duct tape that I used. Not to mention, I would have saved myself some time and frustration, and would have actually had a spring wreath to hang in my window. Oh well, you win some, you lose some. But I did want to post about this unsuccessful craft project to remind everyone, myself included, that not every project turns out perfectly, or even decent for that matter. And that is okay! Has anyone else used a pool noodle to make a wreath form? Any suggestions as to how to avoid a pointy wreath? 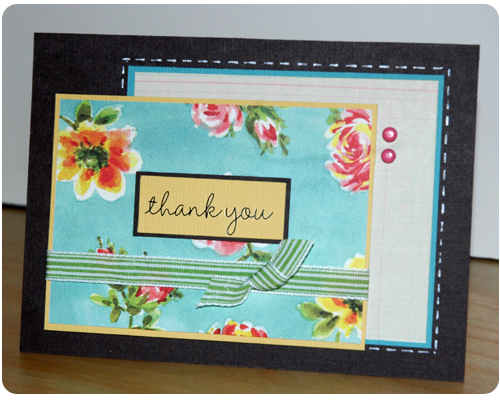 I made these 5 thank you cards from one $0.10 sheet of patterned paper. 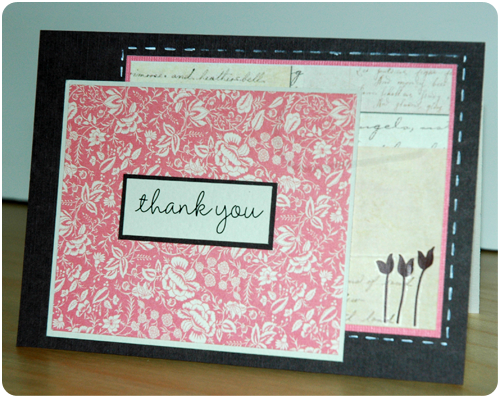 The patterned paper that I used looked like a quilt; each pattern seen on the cards was a block from the original sheet. 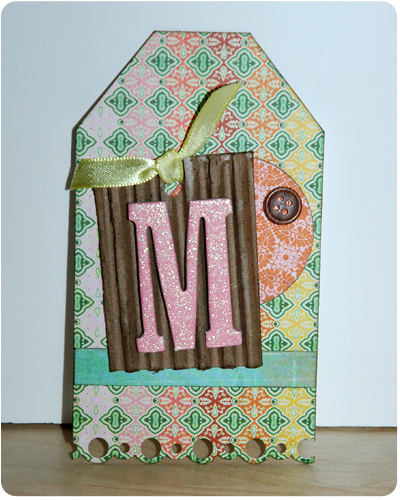 I cut the blocks apart, matted them, layered them on my card base, and added the sentiments and embellishments. I found coordinating cardstock by looking in my scraps, and all the rub-ons, and ribbon I already had in my stash of supplies. 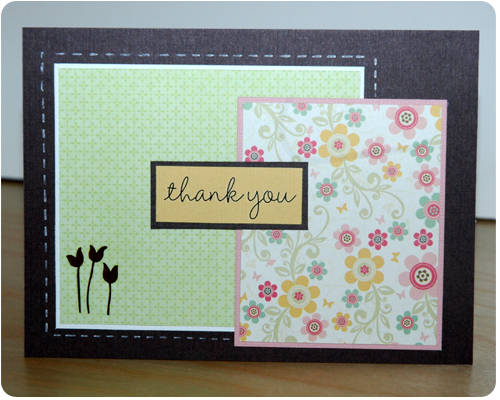 For $0.10 I made five adorable and simple thank you cards. Sure beats those little packages of 8-10 thank you cards that you buy at the store for between $7 and $10 a package. On Saturday April 14th (my birthday!!) 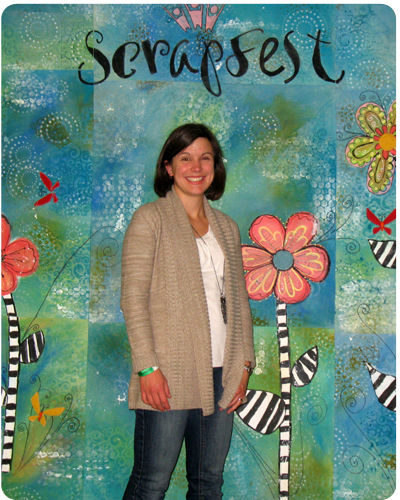 I attended Scrapfest in Kitchener, Ontario. 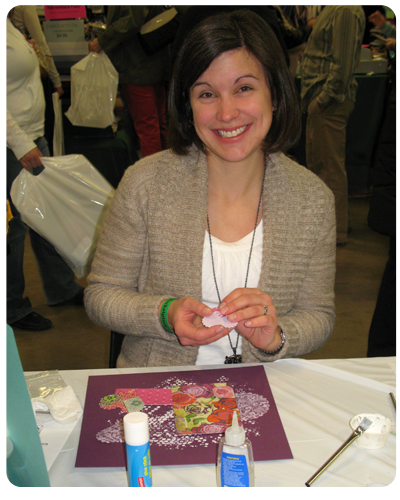 For those of you who may not know, Scrapfest is a show devoted entirely to paper crafts. Retailers from all over Southern Ontario come together in a large auditorium where they set up shop for two days. Crafters who attend the show are treated to an unbelievable shopping experience, draws, door prizes, make-and-takes, and product demonstrations. There is also crop space available. This is the fifth year that I have gone to Scrapfest and I love it. I love walking from booth to booth checking out all the products, seeing the gorgeous layouts created by all the incredibly talented designers, and talking to other people who love paper crafts as much as I do. It is amazing!!!! One of my favourite things at Scrapfest are the make-and-takes. 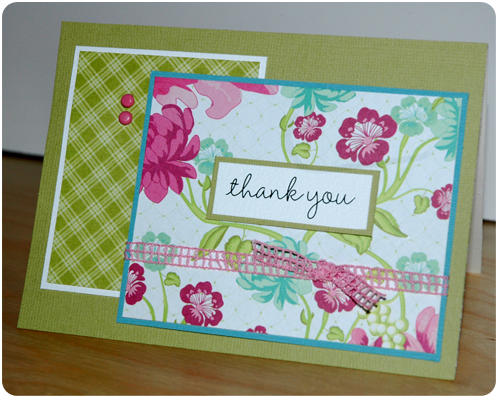 All you have to do is pull up a chair and another paper-lover is there to show you a new and interesting technique that you can then try on a layout or card. Here I am doing a make-and-take where the technique being shown was simply brilliant! We painted the back of bubble wrap (on the side where the bubbles are) and then lightly pressed the bubble-side down onto a piece of cardstock in order to create a background onto which to place our patterned paper and pictures. I loved that this was such a simple and effective way to create an interesting background using something that we likely all have lying around our homes somewhere. 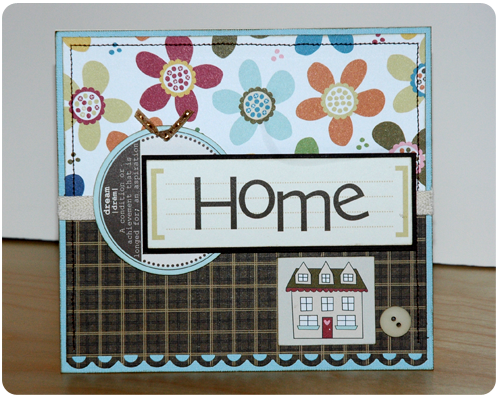 I left Scrapfest feeling inspired, excited about scrapbooking and card making, and armed with a few new supplies and a million ideas. I could not wait to get home and work on my projects and put all these new ideas into action. Scrapfest is definitely worth attending. The shopping is fantastic, the ideas are priceless and there is something about being surrounded by so many others who love this hobby as much as you do. If you get the chance, you should definitely go. Did anyone else attend Scrapfest in Kitchener? If so, tell me what you thought of it? I sometimes like to make cards to give on different occasions. We typically give cards for birthdays, Christmas, graduations, births, weddings, anniversaries, Valentine's Day - the usual events that come along every year. And while giving cards on these occasions is thoughtful, what about other more unique events that may happen in a friend or family members' life? What about those major milestones, that are important to your friends and family and that you, as someone in their life, want to acknowledge and celebrate with them? Such an event might be the purchase of a new home. And wouldn't this card be the perfect thing to celebrate that with? 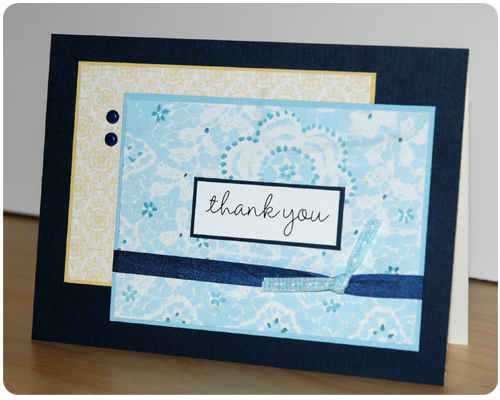 Giving a unique card to a friend to celebrate an event that you know is important and significant in his/her life is especially thoughtful. I know that I have always cherished the cards that I received from people to celebrate unique moments and experiences in my life - cards to celebrate a new job, to apologize for having to miss our wedding, and to to congratulate us on our first apartment - unique events that friends and family knew were important to me and wanted to celebrate and share with me. It was these gestures of thoughtfulness in the form of a handwritten note that I was so touched by and will remember always. If your friend has just successfully ran a marathon, your mother has finished a floral design course, or your nephew has reached his goal of reading 500 books...why not send a card to celebrate those occasions? What other unique and different events might you want to give a card for? Please let me know any suggestions that you might have? I have always wanted to make a blanket for the couch in my living room. For years (yes, years) I have searched for the perfect pattern, the perfect yarn, and the perfect colours. And I did not have any luck....that is until just before Christmas when I found this pattern for the Garden Patch Granny Afghan by Lion Brand. Check it out....it is gorgeous! It was love at first sight - small, medium and large sized granny squares crocheted using beautiful yarn in incredible colours, and then joined together into a gorgeous afghan!!!! 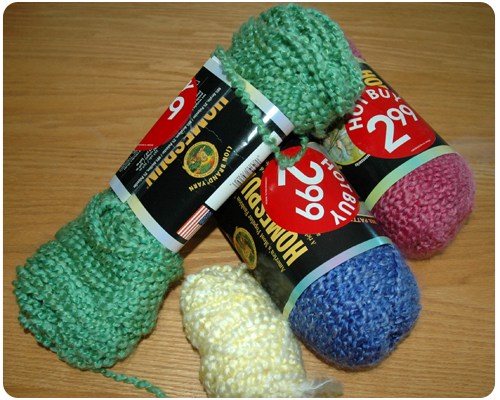 Added bonus: the yarn (Vanna's Choice) was on sale during Boxing Week for $2.49 a ball (regular $5.99). Excellent! So I have started this project and I am so excited about it. 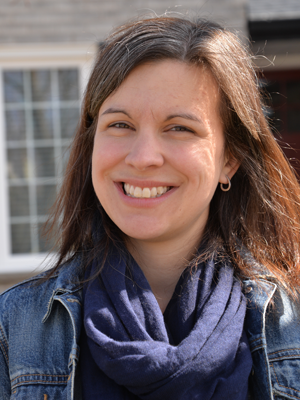 It is a big one, to say the least, so I thought I would introduce you to the project today and keep you posted as I move along. The colours that I chose to use are more orange/red than pink and will match my living room decor better. 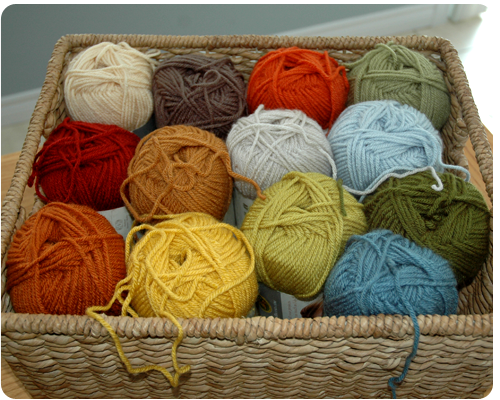 These are all the colours used, but only half the yarn. The other half of the yarn is in a tub in the basement - told you it was a big project! 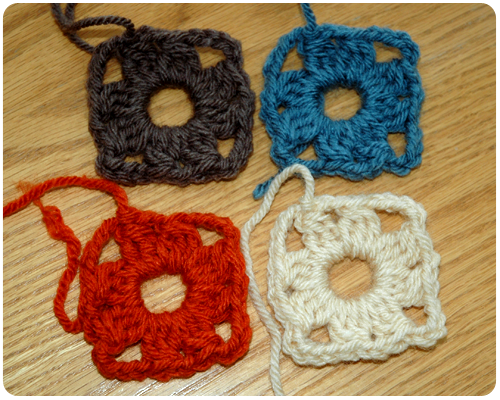 and a handful of small squares. 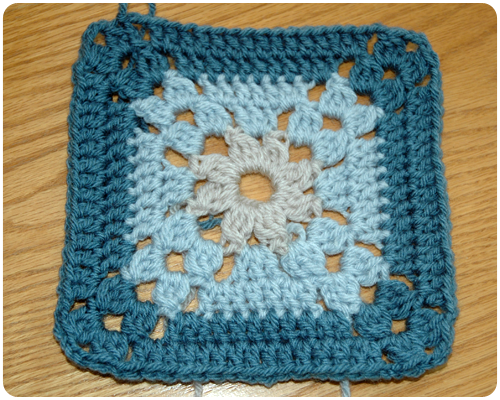 Now, as the pattern goes, a slew of large, medium, and small squares are crocheted in various colours, and colour combinations, and are then arranged into five different rectangles. 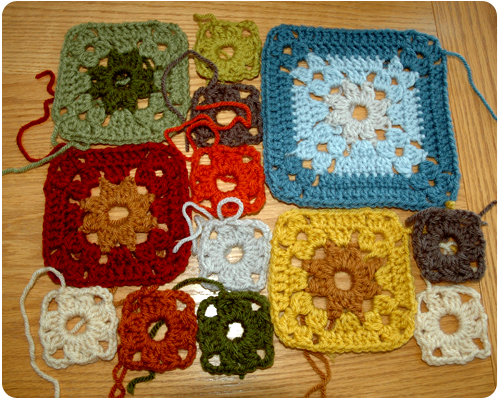 The squares in each rectangle are then sewn together, and then the rectangles themselves are sewn together into the finished afghan. Make sense? If not, check the pattern. 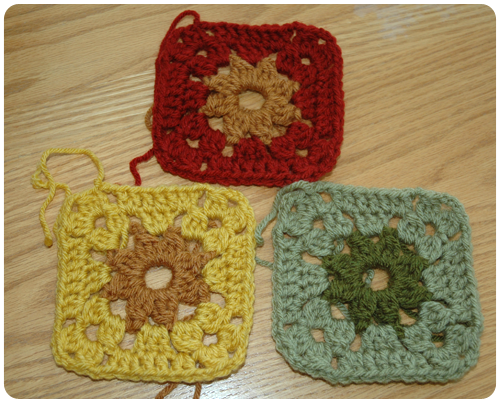 I have squares for one rectangle fully crocheted. I still need to block them and sew them together, but here they are all laid out so you can see how they will fit together. 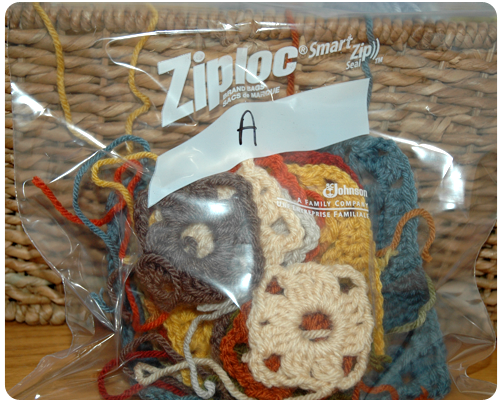 I have realized that I will need to make myself a blocking board for working on this project so until I get that done I am going to keep crocheting and simply sort the squares I make into baggies labelled for each rectangle (A to E). I am having a blast working on this blanket. I love how the colours are coming together. 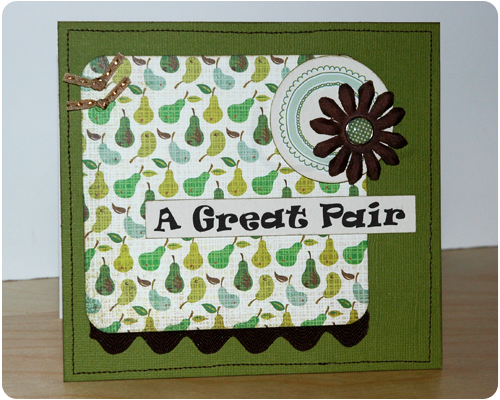 When I saw this 'pear' patterned paper, I knew that it was perfect for a play-on-words engagement or anniversary card. It was from a package of papers that were intended for making a recipe book. So I made an engagement/anniversary card. A few weeks ago I was in a local used bookstore browsing through the crafting section for some vintage crochet patterns. I always enjoy looking at these patterns because while the color schemes may be a little dated, the patterns are still valuable and can easily be worked using modern color combinations. Plus, they are cheaper than buying current patterns...and I always find it interesting how cheap these patterns were to begin with. I mean, $0.95 for a pattern book??? Anyway, I had no luck in the crafting section, but on my way out of the store I hit the jackpot. In a large box, destined for the trash, lay this pile of vintage crochet books. I rummaged through the box quite enthusiastically to find each and every crochet pattern book that was in there, and yes, the store owner looked at me like I was a little nuts. 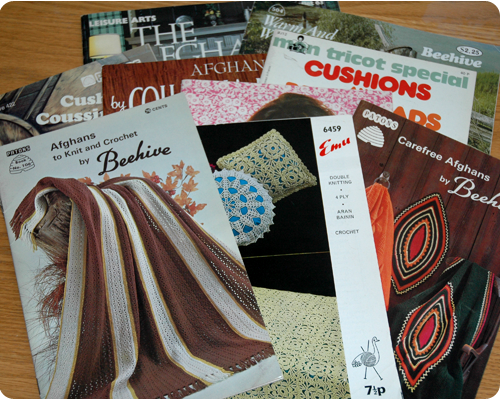 Oh well, I brought home a pile of vintage crochet patterns. 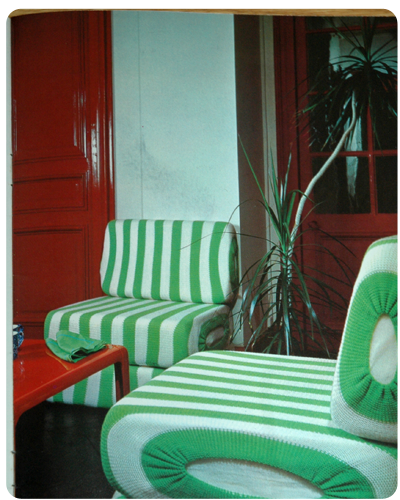 But there are some beauties that could easily be updated to a more modern look by changing the color scheme....like this table cover. I would definitely suggest looking for vintage patterns the next time you are in a used book store, or even a thrift shop. You never know when you might hit the jackpot. 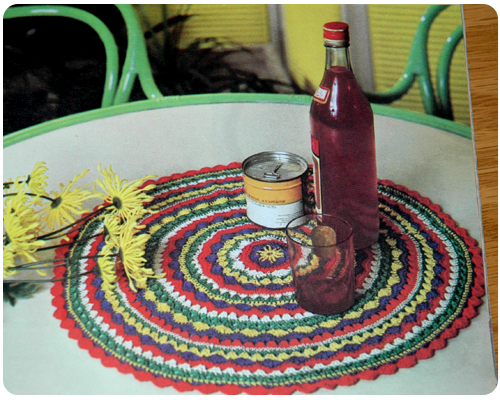 While I have yet to make anythings using one of these patterns, I certainly have plans to - I really like the table cover (shown above) and think it would look great on my kitchen table. 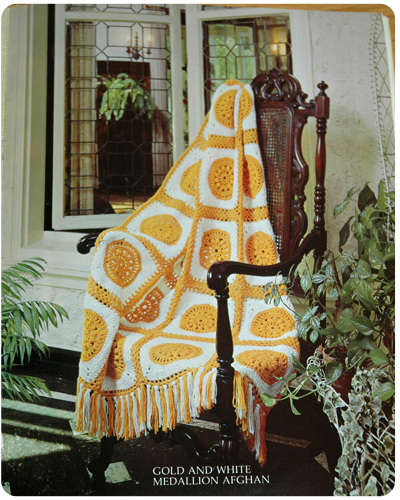 Do you search for old crochet patterns? Have you ever made something using an old pattern?